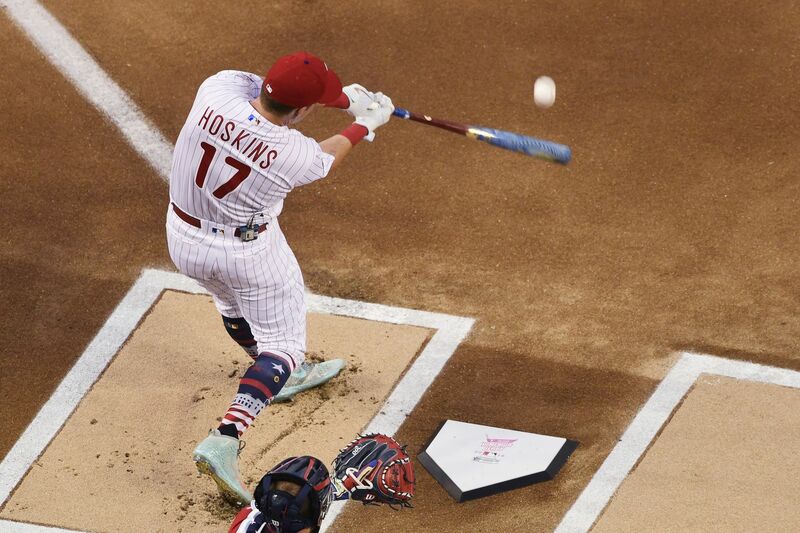 Phillies left fielder Rhys Hoskins during the Home Run Derby during the all-star break. WASHINGTON — Look to the left in the National League clubhouse here Tuesday and you would have seen lockers for the Atlanta Braves' four all-stars. Look to the right and there were five members of the Milwaukee Brewers. Three of the Chicago Cubs dressed along the far wall, while three of the Los Angeles Dodgers got ready near the front of the room. And over there near the back, wedged between players from other teams, sat Aaron Nola, the Phillies' lone representative in the 89th annual All-Star Game. Consider it a reminder of where the Phillies have been for the past six years. Mired mostly in last place in the NL East, they were off the grid, out of the spotlight, an also-ran in the shadow of baseball's marquee franchises. It takes a while to bounce back from that, to get everyone's attention again. Slowly but surely, though, the Phillies are doing it. They played their first ESPN Sunday Night Baseball game last month and are scheduled for another in August. And they were among the most talked-about teams here over the past two days — and not just because they spent the all-star break in first place, either. With Baltimore Orioles star shortstop Manny Machado certain to be traded this week and everybody wondering where he might go, the Phillies were in the thick of the chase. Even though reports have surfaced that Machado will be dealt to the Los Angeles Dodgers, a source from a rival NL team revealed how close the Phillies came, saying that Orioles general manager Dan Duquette "still likes Philly's pitching [prospects] enough to keep them in it as of [Tuesday] morning." It might not seem like much consolation if Machado is wearing Dodger blue when games resume Friday night, but at least the Phillies have re-entered the conversation. They're not wandering baseball's wilderness any longer. They have returned to the national scene. "I mean, we don't have guys that are hitting 20-30 home runs right now, but we're all playing as a team and guys are contributing that some people wouldn't think would be contributing on a regular basis," Nola said. "I don't think anybody believed that we were going to be at the top of the NL East because we've been at the bottom the last few years. I definitely think maybe people are starting to notice now." It was important, then, to slugger Rhys Hoskins that he competed in the Home Run Derby on Monday night. Nola believed it was significant to pitch in the All-Star Game, too, in order to assure the Phillies would be represented by more than merely a tip of his cap in pregame introductions. "I think it's one of those things where, kind of the same with the team, there's not a whole lot of national media on us with what we've done so far this year," Hoskins said. "That ball might be starting to roll a little bit faster now with being in first place. But I think the more exposure that we can get as a team and an organization will be better for us down the road." Despite being unable to pull off a trade for Machado now, the Phillies will make a hard charge for him in the offseason when he hits the free-agent market and can choose where he wants to play. The 26-year-old shortstop is exactly the hitter they need in the middle of their lineup. He's also the star that can energize a fan base in a city that loves its superstar athletes. Machado acknowledged the chants of "We Want Manny!" from fans at Citizens Bank Park when the Orioles visited earlier this month. But what will really bring him to Philadelphia, aside from the nine-figure contract that the Phillies can afford to give him, is the chance to play for a contender. And Machado has taken note of how well the Phillies have played. "They're a good ballclub," he said. "They're young, they're hungry, they want to win. They've been impressive." It's OK, then, that Nola didn't have any teammates with whom to share the all-star experience once Hoskins took his bats and went home after the derby. Hoskins' time in the all-star spotlight will come, Nola said. Same with closer-in-waiting Seranthony Dominguez. Power-hitting catcher Jorge Alfaro and speedy infielder Scott Kingery could play in this game someday, too. When Nola makes his next all-star appearance, it's doubtful he will do so alone. "They'll all be here at some point. I believe it," Nola said. "I think everybody else in our clubhouse believes it, too. They're going great for our team, and I'm glad we have them. They'll definitely be here one day.